The Spanish firm is claiming compensation following the abrupt cancellation of its project off the Vietnamese coast. Vietnam may have to pay millions of dollars in compensation to a Spanish oil firm following its latest retreat in the face of threats from China. Repsol has confirmed that it is in talks with the Vietnamese government following the abrupt cancellation of the “Red emperor” oil and gas project off Vietnam’s southeastern coast in March. The company was informed just days before drilling was due to start that the project was being shelved. A platform, rig and tankers now lie idle in the southern port of Vung Tau and the compensation claim being pressed by Repsol is likely to be substantial. Vietnam has made no public comment on its decision, such is the sensitivity of any decision made under pressure from China. China is reported to have threatened military action to force Vietnam to cancel a similar project in an adjacent block near Vanguard Bank last year. Both areas are within Vietnam’s 200-nautical-mile EEZ but are also close to areas claimed by China as part of its “historical rights” to much of the South China Sea. 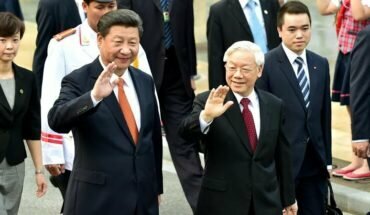 Beijing has warned international oil firms not to get involved with Vietnamese projects in disputed waters, and its current muscle flexing in the South China Sea has underlined the potential threat to Vietnam. The “Red Emperor” project could have been worth $200 million to Vietnam. China’s growing dominance in the region looks set to stymie any hope of a much needed boost for the Vietnamese budget. Public debt has soared to 64% in recent years and further austerity is likely as existing oil reserves are exhausted.